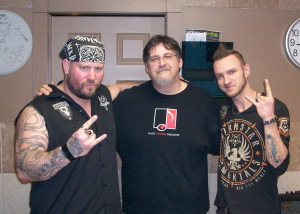 Saving Abel is a hard-working, perpetually touring hard rock band from Memphis, Tennessee. They are as blue-collar as it gets. countless towns, and multitude of miles to get their music out to the masses. themselves playing in smaller venues to smaller crowds, until they had built up necessary momentum again to get them and their music in front of the larger crowds. influences with the heavier styles of more contemporary hard rock acts of today. The band has gone through changes that would have made lesser bands call it a day, namely the departure of their original singer and co-founder, Jared Weeks, who left the band to pursue a solo career in Nashville, Tennessee under the production of Skidd Mills. 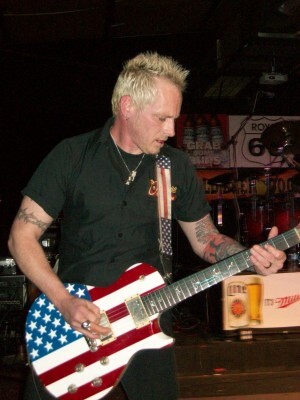 Such a loss usually signals the death knell for most bands, but not Saving Abel. They regrouped as a cohesive unit under the frontage of their long-time friend and new singer, Scott Austin, formerly of Trash the Brand. 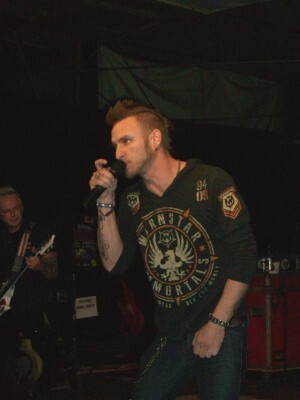 Under the banner of Scott Austin, Saving Abel has released their first album without Jared Weeks at the vocal helm, called “Blood Stained Revolution” and are commencing their 2015 touring season this April, with shows all over the US — from the Texas, the Deep South, the Midwest, to the Eastern seaboard, and beyond. I recently caught up with the band in one of the remote corners of the Ozark Mountains at the Royal 66 Club in Mountain Home, Arkansas and sat down with Scott Bartlett and Scott Austin to talk about the band’s latest album, their current tour, and some special causes that are near and dear to their hearts. Brian McKinny: The founding members, Jason Null and Jared Weeks (departed in 2013) are from Corinth, Mississippi. Scott, you live in Memphis, Tennessee. Memphis is a town whose cultural history is steeped with all manner and style of music — legendary gospel, rhythm-n-blues, jazz, and early rock music have strong associations with the City of Memphis. What’s it like living in such a musical town like Memphis for a guy like you? Scott Bartlett: It’s pretty awesome, actually. I should clarify, because I grew up in Baltimore, Maryland, and I moved to Memphis when I was 18. I own a home and make my residence there, and in spite of some high crime areas, I love it, and am proud to live there and call it my home. I’m also proud that Memphis has called me their own, because I’ve lived there more than half my life now. I moved from Baltimore to the South on purpose, because I love Southern Rock music, primarily the Allman Brothers Band, all that 70’s guitar rock. I got into a few schools down there in the South — the favorite I went to visit and ended up attending was Rhodes College, because of the Memphis music scene. So I convinced my parents that I’d be a good boy, and I wasn’t a good boy. I got my degree and everything, but I partied pretty hard, and I still do to this day — I’m a guitar player in a rock band — it’s what I do. was such a huge box office hit, and put the spotlight on the music scene here again with Sun Studios and Stax Records from the old days. Led Zeppelin’s “Houses of the Holy” was recorded there. The Allman Brothers recorded at Ardent Studios there, as well. There’s just so much going on with music in Memphis. You can’t ever separate the two. Music is the air that Memphis breathes. It’s in the blood. McKinny: The band was originally signed by Virgin Records while performing at a VFW hall in Jackson, Tennessee. Tell me a little about the experience of being signed for the first time, and what that was like for you and the band as a whole. Flom (then CEO of Virgin Records) was on the 18th green of a golf course when he got a phone call — he heard “Addicted” on his cell phone, and immediately said, “That’s it, sign them! We’ve finally got ourselves a Southern Rock band for the label.” At the time, Virgin was looking for a rock act that was going to shake things up a bit, because they were primarily focused on other music genres — they had just signed Katy Perry, and other pop acts. They’ve since signed Alice in Chains, and rock is in a different position now than it was then, around 2007. The last song on our first album was “Addicted,” and that sort of dictated where we were going, because it was a sort of harder rock, mid-tempo song, with a lot of heavy guitar mixes and guitar solos. McKinny: Did you see that song as helping to give the band the focus that you needed at the time to drive the band in the direction that you wanted to take it? was very singer-song writer oriented, and our producer was trying to push The Black Crowes style of band and music, and I felt like, “I really love The Black Crowes, but I don’t see this outfit bringing a (Hammond) B-3 organ into the mix.” I don’t see different instrumentation; I see hard, cutting guitars with Humbucker Pickups, and in-your-face lyrics — think more contemporary, active rock with a Southern “twang” to it. McKinny: What were the logistics of rehearsals and recording like at the beginning, with half the band living in Memphis, and the other half living in Corinth, Mississippi? money playing music – I was in something like six bands in Memphis at the time, and teaching guitar lessons was working for me because I had a private studio with around 45 kids as my students. When you have a degree in Classical Guitar Performance, there’s not much else you can do, except teach. I had done an internship back in Baltimore writing jingles for commercials and to me that felt like, “Great, I’m selling out and I’m 26 years old.” And then, our producer convinced me to roll the dice, saying “I really think there’s something good here.” It’s kind of a cool story, because I literally had to defer payment on recording six songs to just try to be in a band for a month — we formed the band, and I just knew we were onto something; we all did, obviously, but it was, at the time, a big financial risk, and I’m just happy it worked out for all of us. 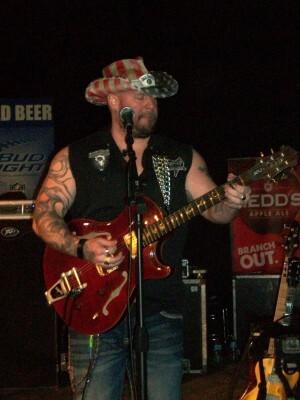 McKinny: Back in 2009, Saving Abel toured Canada with Nickelback, Hinder, and Papa Roach. There was a trumped up controversy back then in the media between your band and the guys in Hinder. What’s the real deal on that situation? Bartlett: Yeah, that was pretty funny, because those guys are some of my best friends. I’ll give you a little side note: that was entirely their doing. It was a publicity stunt, and it worked! The first time I met them, they were like, “We’re going to fight,” and we were back stage at a massive event for the troops — it was at the NBC Building at Rockefeller Plaza in Ney York City. We had just released our song, “18 Days” and we were second to last to go on, Hinder was on the bill and their dressing room was right across the hall from ours, and they invited us to come over. So we were in our dressing room, and we were doing push-ups, and getting pumped up thinking, “Alright, I guess this is going to happen!” So we go over, and the guys in Hinder are just sitting around, and they ask us, “Do you guys want a shot of Jager?” I said, “Sure! Hell, let’s have seven!” So it was pretty funny and everything worked out. They said, “We were just poking fun at you guys, because you’re the hot ticket and we were the hot ticket about three years ago, so we figured we’d ride on your coattails for a bit,” and it was all great free publicity. It was actually a brilliant move from a public relations standpoint. McKinny: Tell me about the tour, because both Hinder and Papa Roach were on that tour with you, in support of Nickelback. What was it like to be on such a mammoth tour, and what did you learn from being on that tour with those bands? Bartlett: That was a lot of fun, man. Being on that tour with those bands was a great experience, because none of the guys in those bands take themselves too seriously. One of my favorite quotes is “Rock and roll is way too serious to be taken too seriously.” That’s how those guys on that tour, including our band, approach it, I mean, you’re sitting here talking to me back stage while I’m getting dressed and warming up for the show and getting it all on tape. We just roll with it. McKinny: You and the band have been around for a while now, and have toured and traveled with many different bands. Who are some of the bands you’ve toured with over the years who stand out most in your recollection, and why? think we’ve ever met on the road. They would rent out entire movie theaters on our days off — literally an entire movie theater in Chicago, just so the entire crew and all the bands and people that support the tour could go watch a movie, and they’d even have it catered and an open bar, and we’d sit around and watch movies all day. You don’t get much cooler people than that. They would have private parties, but they’d invite people from around town, and we’d run into that a lot — people who had been through the grind of going up and down in the industry; they understand that thing we talked about earlier, not taking it all too seriously. So when people just let their guard down, you see people – you get close to people, like seeing Jacoby from Papa Roach crying on the phone with his wife because he loves her and he misses seeing his kid when he’s out on the road. There’s just something endearing about that, because it’s human, and it becomes like a family when you’re out there and start to get close to the people you’re working with. So every badass you see on stage at a rock show has a life outside of that realm, and they’re just as human, flesh-and-blood as everyone else. They miss their wives, girlfriends, kids, family. But this is what we do, how we make our living and it comes with the territory. We’ve been very lucky to have met and become good friends with a lot of the bands we’ve toured with, and that’s one of the best things about this business. McKinny: You and the band have been very active supporters of our military and veterans. What guided you to do those shows in support of the troops? What’s the philosophy behind your patriotism? Bartlett: Well basically, it boils down to the fact that they asked us if we would. We had a song that started out being about this sheriff, Buford Pusser, from the “Walking Tall” movies. He’s from Corinth, Mississippi, and a local legend. He was shot in the head, and his wife was killed right there on Highway 72 in Corinth. He was trying to clean up a local crime syndicate in town, and he literally used to walk around carrying a two-by-four piece of lumber with him. Anyway, they finally ambushed him on the highway, and shot his wife, and shot him and left him for dead. But he survived, waking up in St. Jude Hospital. The first line in his memoirs was “It’s been 18 days since I had to look at myself,” because he had had a bandage over his entire head because of the bullet wound and surgery. So that song turned into a love story of sorts, and then the military adopted it as their own on our MySpace page, and they had a video of soldiers returning home from combat with our song playing in the background, which was a very powerful thing. Our label wanted to take advantage of that popularity, but we bristled at that suggestion. We told them, we’d love to go overseas and play for the troops, but just don’t exploit the song. I mean, we turned down a tour with Motley Crüe just so we could go play for the troops in the Middle East. It’s just raw patriotism – that’s what it is. We drop everything if they ask us to do something. We love our country, care about our troops, and the belief that democracy works, and our troops make sure that we enjoy our freedom every day. It’s the least we can do. McKinny: Aside from supporting the USO and our troops here and overseas, what are some of the causes and charities that you support as a band? Bartlett: (Yelling across the dressing room) Hey Scotty (Austin – singer), come over here and talk with Brian about autism! like doctors who specialize in autism, speech and behavior therapists, and they support the research into finding the causes and hopefully, one day a cure. Autism has become such an epidemic that it’s affecting more and more people, and Autism Speaks is a great organization that we support. McKinny: Let me turn now to the new album, “Blood Stained Revolution.” This is the first album with you as the lead singer. If you had to sum it up in one sentence to a potential fan who had never heard your music before, what would you say to describe it? like to walk a mile in our shoes the last year or so. The whole past year has been non-stop for us, doing so many shows, recording the new album when we had the chance, and all the changes that we’ve gone through – it was meant to inspire the imagination. McKinny: What was the most difficult part of all those changes of the past year, with you coming on as the new singer of the band, and having such a heavy touring schedule, while trying to record a new album when you can find the time to do so? As far as how things have changed in the band, I don’t have the best frame of reference, because we’re my favorite band, you know? And I’m the new guy, even though the guys in the band make me feel like I’ve always been the guy, and so it’s hard for me to speak to the changes, other than from my perspective. For me, I’m just feeling extraordinarily blessed to be able to play music with these guys, write the music we want to write, and to go out and perform on stage for the fans, new and old ever night. McKinny: I understand that the band have created your own record label, Tennessippi Whiskey Records, and released this new album on that label. all the regular online music outlets as well — iTunes, Amazon.com, and all the rest. McKinny: It seems that this band has weathered all the recent changes in the music business rather well, starting your own label, distributing and selling your own product. What have been the biggest changes you’ve seen as far as the business end of the industry goes? interact with our fans, play our music in a live situation, and to market our music directly to the fans in a much more personal way, and we think that’s pretty cool. Saving Abel will be out touring in full force this April, and will be touring all across America the rest of the year, so look for them to be coming to a venue near you sometime soon!